Mordian 7th Regiment: 40k Genestealer Cult - Demolition Claw Acolyte Hybrids painting begins! 40k Genestealer Cult - Demolition Claw Acolyte Hybrids painting begins! Pressing onward with the cult, and moving down through the generations! Now that the purestrains and patriarch are complete I figured I've jump on the 1st and 2nd generation hybrids. While I initially thought I'd just try and bang out all of them at once, I realized that would have been 38 which is way too many to batch paint even for my trusty painting servitor. Instead I decided to stick with the "One detachment at a time" method and pulled out just the 15 hybrids that comprise the infantry portion of the Demolition Claw. I absolutely adore the bomb-chuckers, and added a couple hand-flamers to each unit to dissuade any chargers. I really look forward to them rampaging around the battlefield wreathed in flames and explosions! Much like the last go-around the skin tones will get lighter and more human as they work their way through the generations. 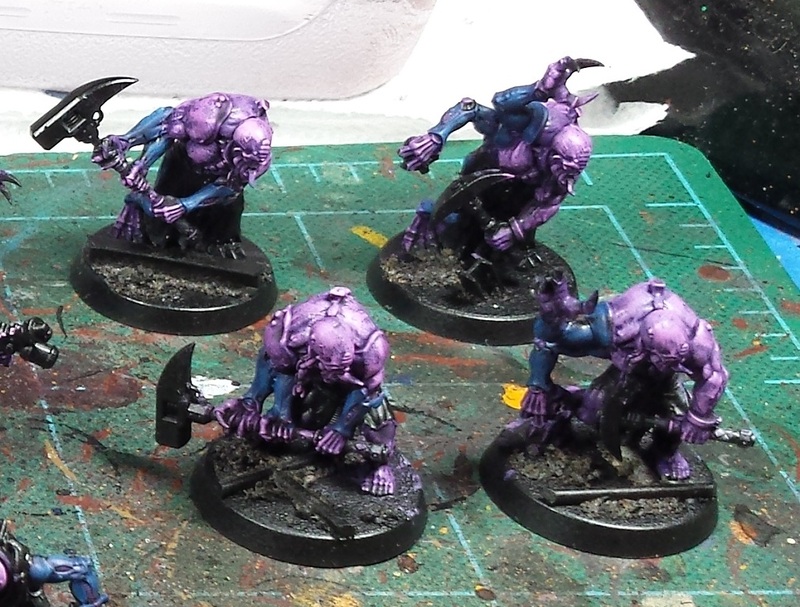 The Acolytes are still fairly purple-y but far lighter than the skin on the purestrains - the miner-style Neophytes will be a step lighter than this, while the pdf brood brothers will be getting an almost human normal skin tone, with just a hint of the purple cast to them (at least that's the plan)! While I was about it I figured I may as well knock out the four Aberrants as they're broadly of the same generation and get the same skin tones. I really dig these sculpts, they're just chock full of personality. Not sure how effective they'll prove to be on the tabletop with just the four of 'em, but at the very least they'll be a little speedbump! Yeah man, Gene-cultists are super cool and I love your idea to lighten the skin, the closer to human the generations get. 1000 Sons reboot? Or just additions? And what do you plan to do with the Space Wolf figs? New army or sell off? @Dai: Thanks man! The plan is to use some of the models to add on to the Thousand Sons, and use the rest to do up a small Imperial Fists/Custodes/SoS force. Should be fun!